Note: IceBridge flew a second mission to the Pine Island region on Wed., Oct. 26. Look for more imagery of the crack coming soon. To see more pictures from the Oct. 14 flight, go to the NASA_ICE flickr page. 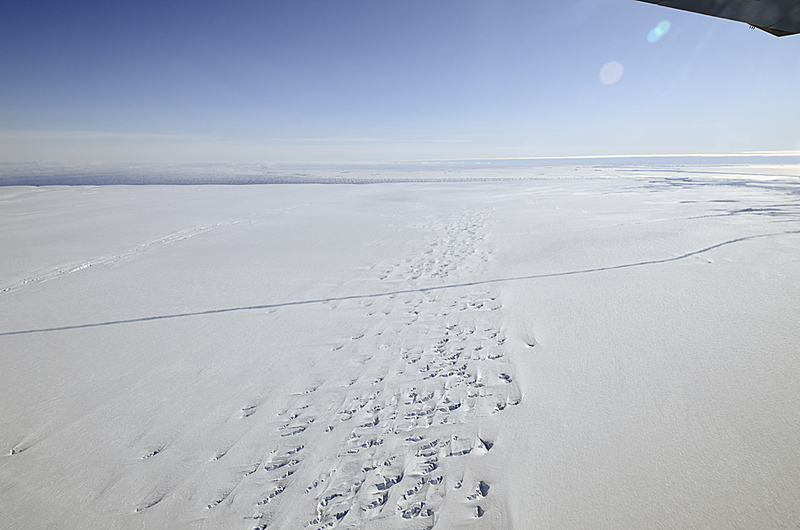 After more than two weeks of successful flights over Antarctica and its surrounding waters and sea ice, one of the more interesting things NASA’s Operation IceBridge team has seen this year is a large crack running across the floating ice shelf of Pine Island Glacier. The team observed the crack on the DC-8’s Oct. 14 flight. The flight was designed to get better measurements of the region around the ice shelf’s grounding line — where the shelf meets the landmass under the water. It was also flown to collect data along lines that a ground-based expedition will traverse in the coming months. That data was collected, as expected. What wasn’t expected was the crack. Pine Island is one of the largest and fastest-moving glaciers in Antarctica. It has captured scientists’ attention for years because of the rate at which its ice is thinning. The ice shelf thins, the grounding line retreats and the speed of the glacier increases. As it sits on bedrock below sea level — West Antarctica is the last place with such so-called “marine glaciers” — and drains about 10 percent of the West Antarctica ice sheet, scientists are concerned about the impact Pine Island’s continued thinning will have on sea level. Ice shelves naturally calve icebergs to shed ice that flows from the landmass to the sea. However, given Pine Island’s prominence as a target of study for glaciologists, the crack is at the very least an interesting observation. The IceBridge team made a preliminary calculation that the area that could calve in the coming months covers about 310 square miles (800 square kilometers), Studinger said. Peter Rejcek, Editor of The Antarctic Sun, wrote a piece about the crack that notes its location is about nine miles north of where a largely National Science Foundation-funded team, led by Bob Bindschadler of NASA’s Goddard Space Flight Center, will drill this December and January. The team will put instruments below the ice shelf to provide data about ice sheet-ocean dynamics. Bindschadler had previously calculated the propagation of earlier iceberg-releasing cracks at less than 50 meters per day. This crack must have moved much faster across the ice shelf, he said via e-mail. “The characteristics of the PIG crack that I find surprising are the fact that it is so far across the ice shelf after not having been observed up until the end of last season,” he said. 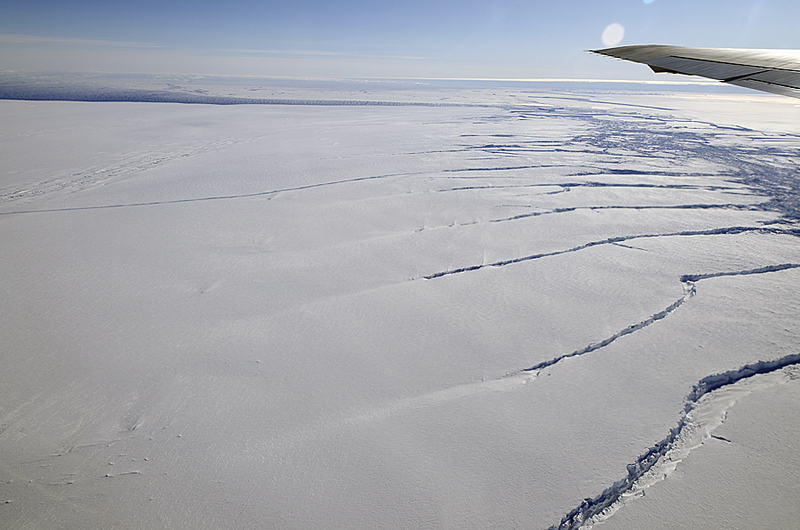 The location of the crack is near where past rifts have appeared in the ice shelf, according to Bindschadler. He estimated that a new, rather large iceberg will probably form in the coming months, if not weeks. Ted Scambos, lead scientist at the Boulder, Colo.-based National Snow and Ice Data Center, agreed that it’s likely that the crack is part of a natural cycle. In 2002, the Larsen B Ice Shelf on the eastern side of the Antarctic Peninsula disintegrated in spectacular fashion, losing about 3,250 square kilometers of ice in a single season. More recently, the Wilkins Ice Shelf on the western side of the peninsula has started to collapse. Scientists believe both events are linked to climate change, though some researchers have suggested that wave action from distant storms could have helped break up the Wilkins Ice Shelf. “If something different happened this time; for example, the pace of calvings changed, or this one was farther upstream from the past ones, then it might signal some major change in the Pine Island system,” said Scambos, adding that the area is changing in other ways, but the rate of calving has been steady over the last few decades.